Horace John, Forse & Co. have handled residential properties for sale in Cardiff, and around the Vale of Glamorgan, for over 50 years. A single bay terraced 2 bedroomed property situated in a small cul-de-sac in this popular area close to Roath Park and the Albany Road / Wellfield Road shopping centre area of Cardiff. 3 Bedroom two storey end of terrace house with off street parking and a large garden. Ground Floor one bedroom flat with garden, situated in Llandaff one of the most popular residential areas of Cardiff. 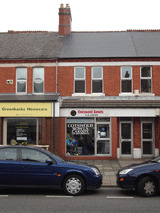 A two-storey mid terrace property situated in one of the mostly popular residential areas of Cardiff close to the University of Cardiff and the City Centre.